Donate directly to Red Cross please. 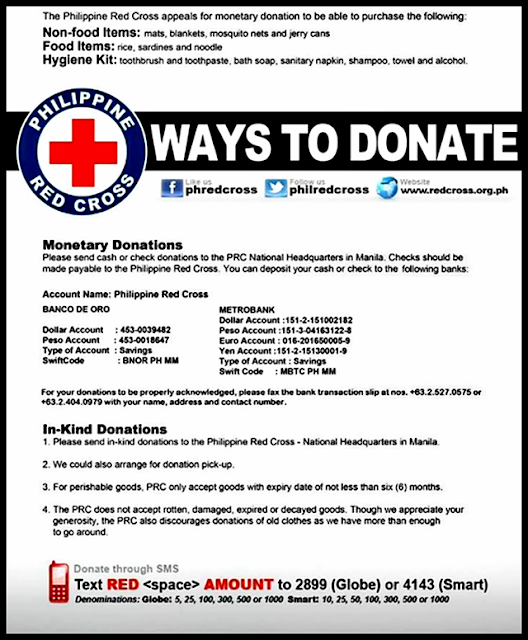 The Philippine Red Cross (PRC) could arrange for donation pick-up. PRC identifies and directly gives help to those in need without going through government channels or politicians. Don't just believe anyone trying to solicit for your donations. Choose well. Be wary of wolves in sheeps' clothing. It is sad to know that some opportunists will do everything just to get something out of other people's misery. Why do these cruel people wanted some in-kind donations for themselves? Pagpipipilian muna ang mga donations bago ibigay? Be on the look out for false good samaritans who come to you in sheeps' clothing but inside they are cruel wolves. They smile a lot, dripping with practiced sincerity. Sa kapwa ko Filipino, hang on, help is on the way. God bless us all.